I wanted to quickly share this recipe because I have been obsessed with it over the last few weeks! This cajun shrimp recipe takes about five minutes to whip up and adds a ton of protein to just about any meal. I've topped salads, quinoa, and even my morning eggs with shrimp and it has kept me feeling much fuller, longer and adds great flavor. 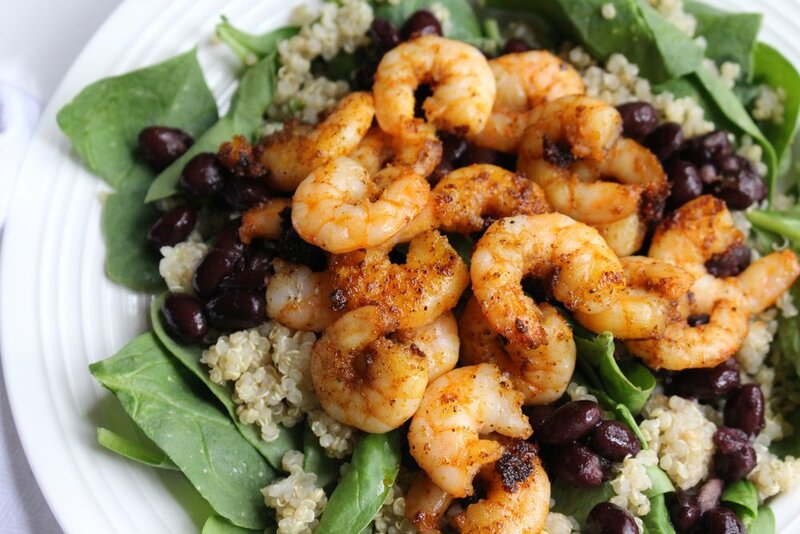 Shrimp, or seafood in general, is one of my favorite ways to incorporate lean meats into my diet. Protein is crucial for maintaining a healthy and strong body, so it's really important that you are getting enough of it day to day. Meal prepping is always a great option and something I also love to do, but I will say - turkey burgers get old just as fast as crock pot chicken! With this in mind, I couldn't help but look for some alternative options. Well, luckily this substitution was anything but a sacrifice! I've made this recipe for both lunch and dinner over the last few weeks and I have to say, shrimp might be the new chicken around here. I love mixing it into a taco bowl or even topping a salad, shrimp is so mild and versatile it truly can be used with anything! I even sautéed it with a little bit of homemade teriyaki sauce, added mixed veggies, and made an entire "fried" rice meal. Like I said - you can make just about anything! The recipe below is a sample of just one way I've been incorporating shrimp into my meals. This has quickly become my go to lunch, I've even stored it and taken it with me to work on many occasions. The shrimp always stays firm, never fishy, and always delicious! First to start, thaw out the desired amount of shrimp by rinsing it under cool water for 3-5 minutes. I usually stick to a handful to a handful and a half, just depending on how hungry I am/serving one or two people. That's it for the shrimp! This recipe is really that easy but packs a ton protein and flavor. 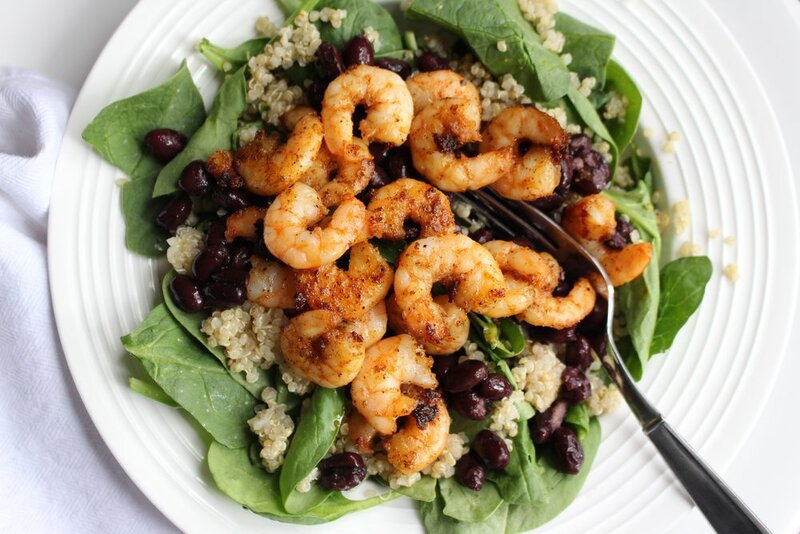 I topped a hefty bed of spinach, quinoa, and black beans with the shrimp and it made for a perfect lunch! I did want to mention, I bought a 2 pound bag of shrimp for roughly $14, carton of organic spinach was around $3.50, 2 pound bag of quinoa was $10, and the black beans were around 0.77 cents. All together my lunch was under $5! Healthy is affordable and absolutely worth it! I hope you give it a try & let me know by tagging #thehealthiestme on the gram!